Nokia’s bike-powered cell phone chargers are being introduced this summer to try and influence more people to travel by bike and be more environmentally conscious. The pedal powered cell chargers can actually power quite a bit of cell phone time, claiming that just 10 minutes of biking at 6mph can give the user up to 28 minutes of talking time (which translates into 37 hours of standby time–not bad). The first batch of Nokia’s bike-powered cell phone chargers will be available in Kenya, and worldwide following that release. The Nokia Bicycle Charger Kit, which can be attached to any bicycle, powers up from the pedaling motion of the bike’s rider. 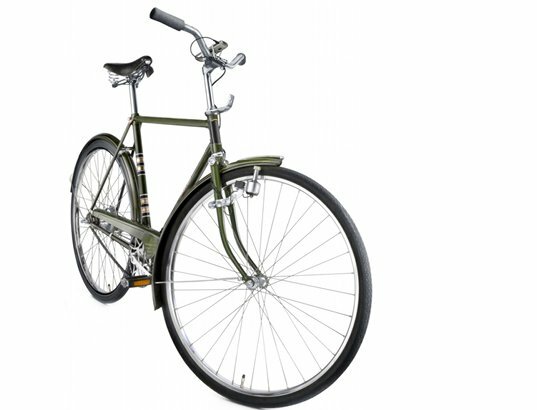 A dynamo–the electricity generator–is powered by the front bicycle wheel as a rider pedals and transfers electricity to a charger attached to the handlebar, which a phone plugs into. “To begin charging, a cyclist needs to travel around six kilometers per hour (four miles per hour), and while charging times will vary depending on battery model, a 10-minute journey at 10 kilometers per hour (six miles per hour) produces around 28 minutes of talk time or 37 hours of standby time. The faster you ride, the more battery life you generate,” Nokia said in a statement. The charger can be used to power any Nokia phone with a 2mm power jack, according to Nokia. The kit comes with two small brackets, in addition to the charger and generator. 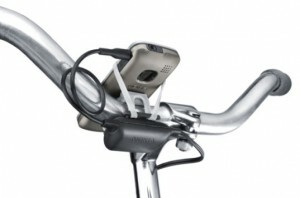 One bracket attaches to the bicycle’s handlebars to secure the charger and a cell phone holder. 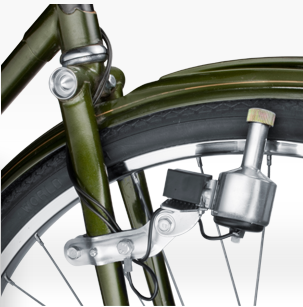 The other secures the small electric generator to the bike’s fork. The world’s largest maker of cell phones said in a statement that its new product will provide “free and environmentally friendly electricity for mobile phones” and will likely be welcomed in areas of the world where bicycles are a transportation staple. Priced at about $18, the charging kit is set to be available from Nokia online and Nokia phone retailers by year’s end. This entry was posted in Products and tagged Bicycle Charger, Nokia on June 29, 2014 by Russ Lowthian.